Post-2005 growth in global oil supply: all unconventional, NGL, or biofuels. “All growth in liquids supply since May 2005 has come from natural gas liquids (NGL), unconventional oil and biofuels which together with refinery gains now amount to 17.4 million barrel per day providing a total global liquids supply of 90 million barrels per day. The US Energy Information Agency (EIA) provides the most comprehensive and readily accessible oil supply data, but owing to budget cuts, is behind in compiling and publishing statistics. The most recent data are for July 2013. 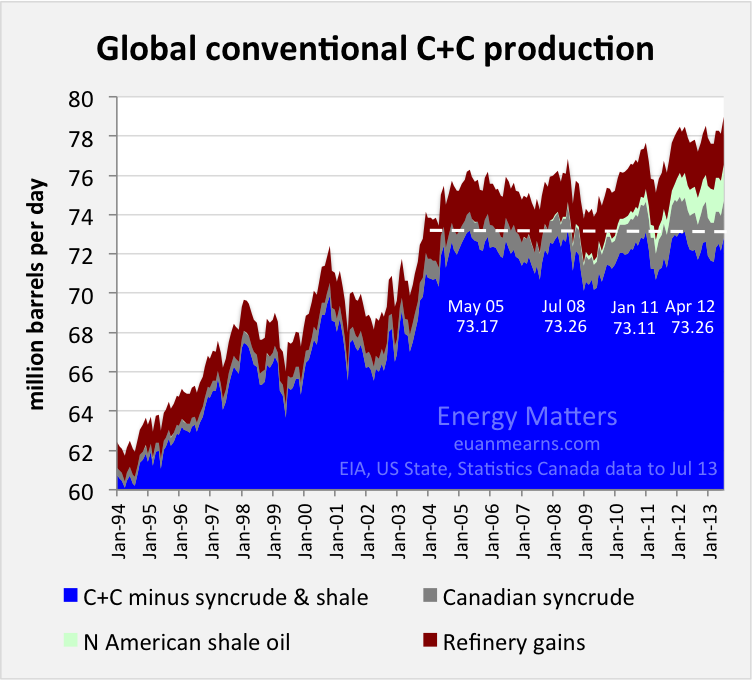 Figure 1 Global crude oil + condensate (C+C) production as reported by the EIA  less Canadian syncrude  (oil sands) and N American light tight oil [3, 4] (Bakken and Eagleford). Chart not zero scaled. Note how conventional C+C production (blue) rose to 73 million barrels per day in May 2005 but has since been following a bumpy plateau. It remains to be seen if 73 million barrels per day will emerge as the peak in cheap conventional oil production. 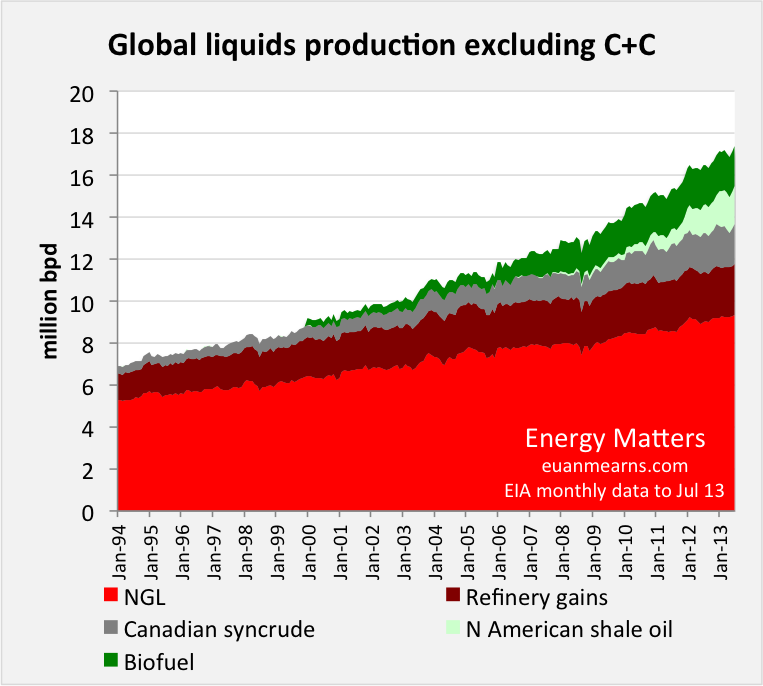 All growth in global liquids supplies has come from unconventional oil, biofuel and natural gas liquids (Figures 2 and 3). Figure 2 Global total liquids production now stands at 90.2 million barrels per day . 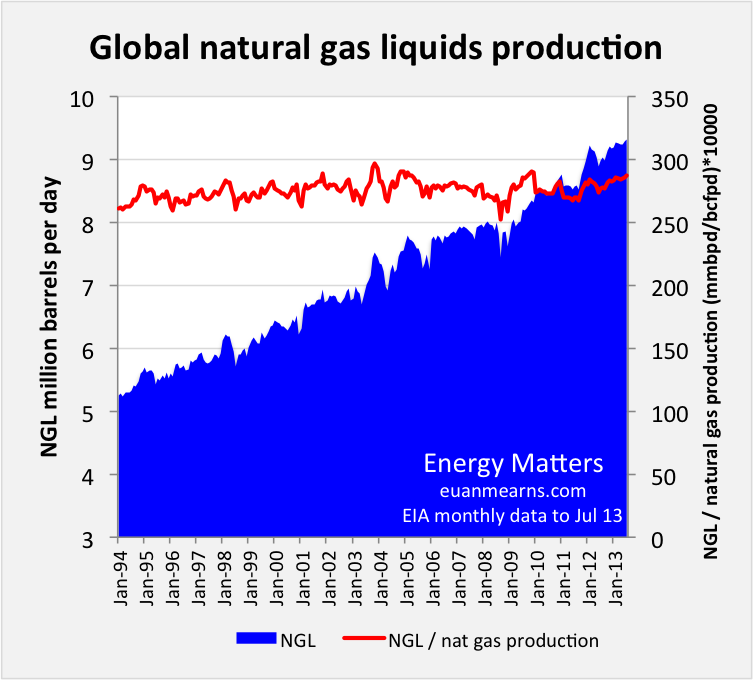 Since May 2005, all growth in liquids production has come from NGL, unconventional oil and bio fuel (Figure 3). 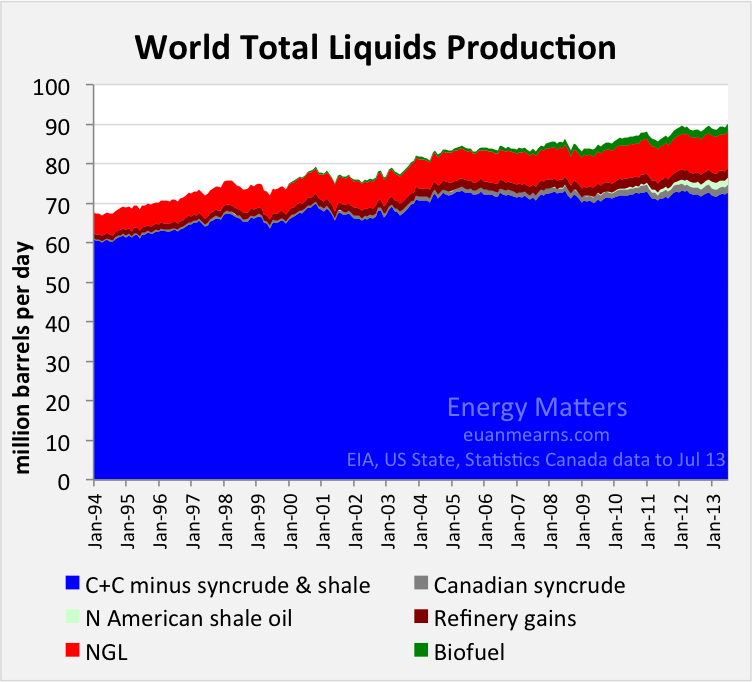 Figure 3 Global liquids excluding conventional crude and condensate. Note that the energy content of NGL is about 70% of crude oil and that significant energy is required to produce syncrude from oil sands and to produce biofuels. Refinery gains represent volume expansion of liquids during the refining process.